...Best of Sicily presents... Best of Sicily Magazine. ... Dedicated to Sicilian art, culture, history, people, places and all things Sicilian. Snow is not as unusual in Sicily as you may think. Mount Etna is usually snow-capped from December to April, and the higher peaks of the Nebrodi and Madonie ranges are usually dusted with snow for at least four or five weeks for a while from late December to early March. The Peloritan, Iblei and Sicanian ranges get less snow, sometimes for just a few days. 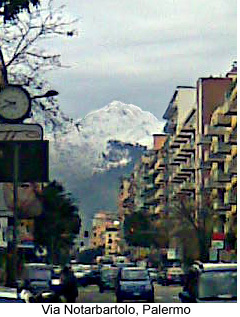 But it's very rare for the low peaks around Palermo, such as Mount Pellegrino, to be covered with any snow at all. This is good news, apart from the picturesque, slightly contradictory, novelty of snow on the palm trees. Like many places, Sicily has suffered the effects of climate change, with some very dry , hot years over the last fifteen. The snow on the mountains is a good indication that normality isn't far away, and it hasn't stopped the early almond blooms of February. With 199 millimeters of precipitation in January 2009, there had been more rain and snow in Palermo province since 1985. The 1973 all-time high for Sicily was 303 millimeters. It should be mentioned, however, that the areas around Etna, the Peloritans and Nebrodis get much more precipitation than north-western Sicily. All this probably sounds a bit banal to those who live in colder climes. Here in Sicily the effects of the unseasonably cool weather are heightened by the lack, in most homes, of central heating. In the past, Sicilian snow could be useful and was eagerly anticipated. It is believed that ice cream and sorbet were invented in Sicily, possibly as early as the Roman period but perhaps by the medieval Arabs. 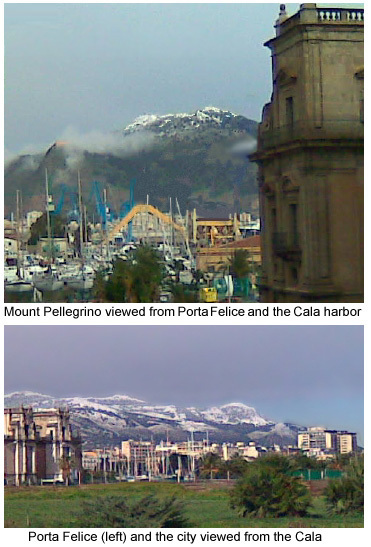 The theory, based on what scant descriptions exist, is that a relay of foot-runners brought snow down from the mountains to Catania (from Etna) and Palermo. This was flavored with honey (the Roman theory) or cane sugar (the Arab version) and fruits. About the Author: Maria Mazzaro writes about nature and environmental topics.